Don't let the live fire of the grill intimidate you. Grilling is a simple, usually healthy cooking method that intensifies the flavor of meat, poultry, fish, vegetables, and even fruits. Tame the flames with these basic grilling tips and avoid both the undercooked and the completely charred next time you grill. Having the right tools at hand make grilling approximately a million times easier. 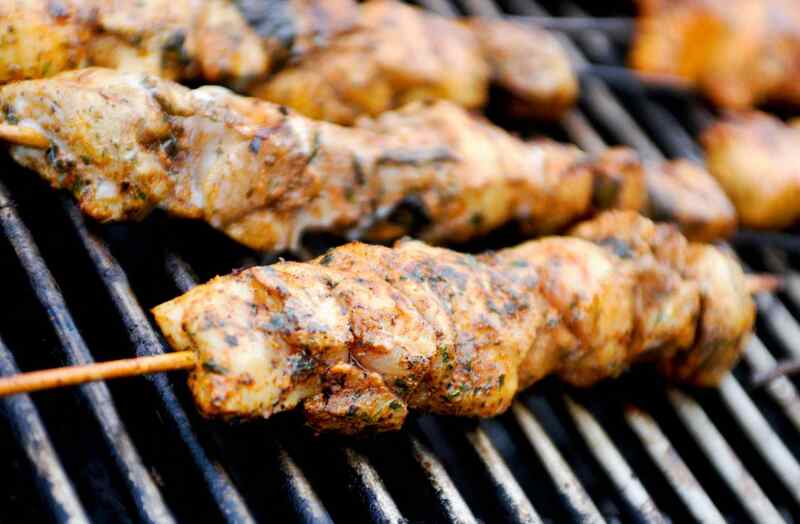 Grilling must-haves include flat all-metal skewers, a small spray bottle filled with water to tame any errant flames, a silicone brush with fine bristles for basting, a wire brush to clean the grill, and a pair of extra-long metal tongs for moving things around on the grill without fear of burns. A clean grill reduces two banes of the cook: sticking food and flare-ups. Scrub grill clean with a stiff wire brush, grill brush, or steel wool. Then brush or rub the entire grate with a neutral-flavored cooking oil such as canola, grapeseed, or vegetable oil. Keep the grill clean by covering it with the lid when you're done grilling each time - the trapped heat will help burn off food and make the grill easier to clean. Moving meat (or vegetables) straight from the fridge to the grill leads to uneven cooking. Let all foods (with the noted exception of burgers) come to room temperature for about 30 minutes before putting them on the grill. Leave 1/4 to 1/2 inch of fat on steaks and chops for natural basting and great flavor in the cooked meat but be sure to score the fat (make small cuts in it) so the meat doesn't curl up while on the grill. Protect fish from the heat of the grill by wrapping whole fish or fish fillets in edible leaves - grape leaves, fig leaves, banana leaves, and corn husks are all great choices. Tie a bunch of herbs together - rosemary and thyme work particularly well - and use them as a basting brush. Sure, they add a bit of flavor, but it also looks great and is completely disposable! Flare-ups burn food, add bitter char, and increase carcinogens in grilled foods. Starting with a clean grill will help, so will cooking with the lid on (completely or slightly ajar). To manage flare-ups that occur despite these precautions, keep a small spray bottle filled with water at the grill, ready to spritz rogue flare-ups. Limit handling items on the grill. Grill completely on one side before turning or flipping, and then cook completely on the other side. Minimizing handling helps meat hold onto its juices, and everything develops attractive grill marks! Chefs can tell when meat is done just by poking it. With a little practice, so can you. Raw meat feels soft, rare meat is still soft, medium rare is fairly resistant but still yields a bit, medium springs back at you a bit quicker, medium well and well will be solidly firm. This is something you can only learn with practice - so start poking! Let meat rest - sit at room temperature (tented with foil to keep warm, if you like) - to allow the moisture and heat inside to distribute evenly. Resting is the final step in cooking meat. Ten minutes is good for steaks, larger cuts need more time, up to 45 minutes for a whole turkey.